Welcome back to explore more on space related facts after celebrating the new year! Just go down memory lane and think of the fancy dress parades you took part in. Apart from the most common costumes such as that of the clown, the frog and Spider Man, have you ever dressed up as an astronaut, in a space suit? In today's edition we will enlighten you about actual space suits which are far more complex than the suits that you make with bits of cloth and cardboard for fancy dress parades. As you know, the relevant temperature, proper pressure, oxygen and many other aspects are needed for a human being to survive in outer space. As space is a place which does not have suitable conditions at all, a complex collection of garments with many equipment which enable an astronaut to survive in the harsh regions of outer space, has been introduced. Known as the space suits, a standard NASA suit costs about $22 million! What is expected from a space suit? * A stable pressure, generally less than the atmospheric pressure has to be inside the suit. Although very low pressures enables easy movements, it would result in breathing problems. * Obviously, there should be breathable oxygen and a proper temperature regulation. Since heat can be lost only due to thermal radiation and conduction (transmission of heat) liquid cooling is done within the suit, and insulations are used on the hands and feet to avoid conduction during physical contact. * Protection from electromagnetic radiation, since in outer space you are directly exposed to electromagnetic radiation of the Sun. This is evident specially during Extra Vehicular Activity (work done by an astronaut outside of his or her spacecraft). * A communication system, which is generally a radio system. * Methods to recharge and discharge gases and liquids. * Ability for the astronaut to move with ease with all these attachments. We have seen the key requirements of a space suit. But, making such a design a reality involves a lot of effort and precision. Let's see what these considerations are all about. We focused on maintaining a constant pressure as a primary concern previously. But, it is easier said than done. When retaining constant pressure in the suit, having a constant volume is the general method. But, there is a possibility for the volume to change, when the astronaut moves, and apart from that, since the pressure in space is zero, the suit tends to inflate like a balloon. In such a situation, the astronaut may have to do extra work to bend his joints, which can be very tiring. Therefore, space suit designers try to eliminate this as much as possible. 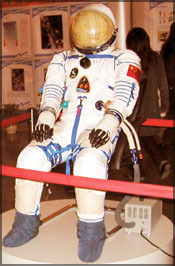 There are three approaches to design space suits which address the above issues. Just think of the armour of ancient kings and knights that you have seen in story books, films and cartoons. 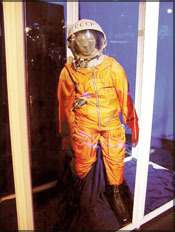 Hard-shell suits are very similar to these and are made of metal or composite material in order to maintain a constant volume within the suit. But, these suits are difficult to move. 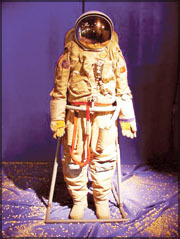 These suits have certain parts as a hard-shell suit and other parts which are made using fabric. This is easier to handle compared to the hard-shell type, although both these types have a risk of depressurisation if the suit is punctured. This type is quite similar to a swimsuit. These are also known as mechanical counter pressure suits, because it is the elasticity of the suit that provides pressure to the body. The head is covered with a pressurised helmet. Although this does not have the risk of depressurisation, it is very hard to put on and take off. forward, he or she is unable to look sideways. This is known as the 'Alligator Head' effect. Suits well, doesn't it?